Mouse monoclonal Aggrecan antibody [6-B-4]. Validated in WB, ELISA, IHC, ICC/IF and tested in Mouse, Cow, Human. Cited in 41 publication(s). Independently reviewed in 5 review(s). Recognises the linear amino acid sequence 394EPEEPFTFAPEI406 present in the interglobular domain (IGD) of human and bovine aggrecan (in both intact and matrix protease degraded aggrecan) but not pig and several other animals. , corresponding to amino acids 413-424 of Human Aggrecan. Samples are usually deglycosylated using 0.01 Units Chondroitinase ABC (Sigma), 0.01 Units Keratanase (Seikagaku) and 0.0001 Units Keratanase II (Seikagaku) per 10µg S-GAG of non-deglycosylated aggrecan for optimal epitope recognition in SDS-PAGE and immunohistochemistry – see Little et al. and Caterson et al. Diluted Technomouse culture supernatant. This antibody detects aggrecan metabolites (intact or matrix protease-catabolised) in human synovial fluid samples. Our Abpromise guarantee covers the use of ab3778 in the following tested applications. WB 1/100. The antibody will see a large range of aggrecan metabolites/catabolites ranging from greater than 250kD down to 50-60kDa. 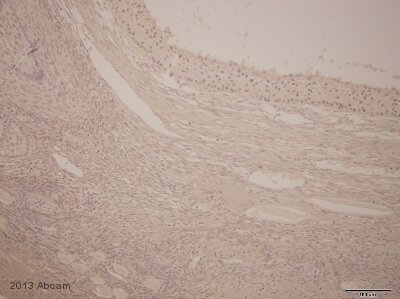 ab3778 at 1/100 staining human articular cartilage by IHC-P. The tissue was formaldehyde fixed and blocked with a serum free protein block. An enzymatic antigen retrieval step was performed and the tissue was then incubated with the antibody for 1 hour. An HRP conjugated goat polyclonal antibody was used as the secondary. 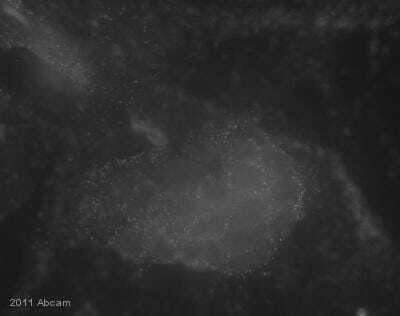 Immunofluorescence analysis of Human articular chondrocytes, staining Aggrecan with ab3778. Cells were fixed with paraformaldehyde and blocked with 1% BSA for 1 hour. Cells were incubated with primary antibody overnight at 4°C. An AlexaFluor®488-conjugated rabbit anti-mouse IgG was used as the secondary antibody. ab3778 used at a 1/50 dilution staining Aggrecan in human umbilical cord matrix mesenchymal stromal cells by Immunocytochemistry/ Immunofluorescence. Frozen sections of the 3D constructs (10µm) (n=2) were rehydrated with PBS for 5 minutes, and endogenous peroxidase activity was inhibited using 1% hydrogen peroxide in methanol for 30 minutes. The sections were then blocked in 3% horse serum for 20 minutes and incubated with a primary antibody, ab3778, for 1 hour at a 1/50 dilution. After primary antibody incubation the sections were incubated with a streptavidin linked horse anti-mouse IgG secondary antibody for 30 minutes. After secondary antibody incubation, the sections were incubated with avidin-biotinylated enzyme complex for 30 minutes, and then VIP substrate (purple color) was applied on sections for 4 minutes. The image shown is at 4 weeks, 25M. Publishing research using ab3778? Please let us know so that we can cite the reference in this datasheet. Unfortunately the indicated primary antibodies have not been tested with Flow Cytometry, and therefore are not covered by our Abpromise guarantee. I am afraid none of the antibodies against Aggrecan in our catalogue have been tested in Flow Cytometry, but if you wish to test them and share your results with us (through the Abreview system) we will be happy to offer a discount code for a future purchase. If you would like to participate in the Abreview system and test ab3778 with Flow Cytometry, please let me know before placing the order so I can raise the discount code for you. Ab97022 is a suitable secondary for recognising Mouse primaries with Flow Cytometry. The only recommendation for this particular antibody is using it at dilutions 1/50-1/200. For general Flow Cytometry protocols I would encourage you to have a look at our Website’s protocols which may be very helpful (open the scroll down menu under the Flow Cytometry / FACS tab to have access to all the FC protocols). I want to use this antibody for immunofluorescenceon my human cell samples: i) monolayer on coverslip and ii) frozen sections, both previously fixed with 2% PFA. Is there any literature that have the same application using this antibody? I would like to take reference from the protocol they used, including the details like the antibody dilution ratio and the antigen retrieval steps). I would be grateful if you can refer to me the NCBI code of these papers and suggest a suitable protocol. Thank you very much. We have quite a few references for this antibody to be used in ICC/IF and IHC-Fr/IHC-P. You can find them listed here and they are linked to the PubMed IDs. You may also be interested in reading our customer reviews, called Abreviews, which include their protocol and images. Varios marcadores pueden usarse para la detección de condrocitos mediante immunohistoquímica. Solo algunos de ellos se han testado en especie canina, el resto me temo que no se han testado, por lo que se desconoce su funcionamiento en ellas. Collagen II: podría usarse ab300 o ab34712. Ninguno de ellos se ha testado en perro. Si está interesado en usarlo en esta especie, quizás le interese participar en el sistema Abreviews de evaluación de anticuerpos, por el cual les ofrecemos un anticuerpo completamente gratuito al mandarnos los resultados de testar el anticuerpo en la nueva especie. Si le interesa, por favor, comuníquemelo antes de realizar el pedido. Aggrecan: ab3778. Tampoco testado en perro, pero susceptible de evaluar su aplicación. CD29: ab30388. En este caso tampoco hay datos de su uso en especie canina, tendría que evaluarlo usted misma. CD44: ab19622 y ab119863. Ninguno de ellos se ha testado en perro, sin embargo, debido al elevado porcentaje de homología con dicha especie, es probable que reaccione. Por ello, si le interesa comprobarlo, puede igualmente usarlo y enviarnos los resultados, beneficiándose de una futura compra totalmente gratuita. SOX9: ab26414 y ab71762. En este caso, ambos anticuerpos se han usado y caracterizado en especie canina, por lo que están cubiertos por la garantía Abpromise. Espero que esta información le sea de utilidad. Si necesita que le enviemos una proforma de alguno o varios de los anticuerpos, si necesita más información de alguno de ellos, o si quiere saber más acerca del sistema Abreview, por favor, no dude en volvernos a contactar. Please send the antigen retrieval protocol for the aggecan antibody ab3778 and the collagen II antibody ab34712. For the aggrecan antibody ab3778, I recommend the following two papers, if they are avalable to you, the first of which describes production of this clone and its use for IHC. We do not have access to the journal. "We tried multiple retreival methods and found that pronase and hyaluronidase will work. The best results were with hyaluronidase". (I suggest trying the hyaluronidase solution that is mentioned below for use with the collagen II antibody: 2mg/ml hyaluronidase in TBS for 2 hours at 37C). Antigen retrieval step: Enzymatic - Buffer/Enzyme Used: 2mg/ml hyaluronidase with 0.125U/ml chondroitinase in TBS for 2hrs 37C. Blocking step: Normal goat serum in 1% BSA as blocking agent for 30 mins · Concentration: 20 % Temperature: 21°C. LOT NUMBER -- NOT SPECIFIED -- ORDER NUMBER -- NOT SPECIFIED -- DESCRIPTION OF THE PROBLEM No staining SAMPLE Mouse cartilage PRIMARY ANTIBODY Dilution 1/50 in PBS/BSA 1% for 1 hour at RT Wash with PBS DETECTION METHOD DAB ANTIBODY STORAGE CONDITIONS Short term at 4°C Long term at -20°C or -80°C FIXATION OF SAMPLE Paraformaldehyde 24hours ANTIGEN RETRIEVAL Enzymatic method: Hyaluronidase PERMEABILIZATION STEP no BLOCKING CONDITIONS BSA 1% 30min at 37°C SECONDARY ANTIBODY Vectastain ABC kit HOW MANY TIMES HAVE YOU TRIED THE APPLICATION? 3 HAVE YOU RUN A "NO PRIMARY" CONTROL? Yes DO YOU OBTAIN THE SAME RESULTS EVERY TIME? Yes ADDITIONAL NOTES In the scientific support, in your answer at the question 4 you say that these Ab is only react with human and cow! But in the data sheet you say that it react with mouse??? Thank you very much for your email. Indeed, I have to agree with you that there is a problem. I would like to apologize for this and would like to reassure you that we will investigate this further and take the appropriate actions. The mouse reactivity has been added due to a customer feedback. Doing however the alignment of the immunogen with the mouse sequence, there is little overlap and it looks therefore rather tricky to get a specific staining on mouse cells. ** *. :*:***: http://www.ebi.ac.uk/Tools/services/web_clustalw2/toolresult.ebi?tool=clustalw2&jobId=clustalw2-I20111207-093227-0400-33224393-pg I will remove the mouse reactivity and replace this antibody for you with another antibody of your choice. Please do provide me therefore with the order details, such as the order number or the order date and name of the person placing the order. Unfortunately, we do have currently however no anti aggrecan antibody tested in your application and species. If you would like nevertheless to use one of our other anti aggrecan antibodies, I would be pleased to make predictions for the suitability. I apologize again for this error and am looking forward to hear back from you. Do you have the certificate of analysis for Lot＃：196340、Lot＃：346985、Lot＃：393795? Thank you for your enquiry. Unfortunately, we do not have a Certificate of Analysis for this product. If there is anything else that I can help you with, please do not hesitate to contact me.